The Murcott, as I mentioned in last week’s post, is a tangerine that deftly walks the line between tangy acidity and breakfast-orange-juice-sweetness, making it exceptionally easy to eat. While I enjoy them in savory dishes and out of hand, it’s the deconstructed creamsicle that Foodwoolf made last Easter that stands out in my mind as the ne plus ultra of Murcott use. So in homage to the fading winter, sticky-fingered childhood memories sitting on the curb eating a rapidly melting popsicle, and my favorite citrus of the season, I decided to preserve the Murcott’s memory by making ice cream. I was a bit concerned about adding the Murcott juice directly to the cream and milk, imagining the citrus’s acid turning my dairy into Little Miss Muffet’s curds and whey, so I decided to take a slightly different tack. Inspired by the tangerine olive oil Neal and I tried at Pasolivo Olive Oil while hunting for wedding venues up on the Central Coast, I decided to infuse my favorite fruit olive oil with the Murcott zest to extract the flavor. The result? Murcott Olive Oil Ice Cream that layers flavors like delicate sheets of puff pastry melting into each other on your tongue. The little girl in me was jumping up and down with every bite, oohing and ahhing at the sweet tangy goodness, and the grown-up in me couldn’t get over the featherweight creaminess in my mouth. Of course, if you can’t find Murcotts at your local farmers’ market, you can try this recipe with the zest of almost any citrus. Satsuma mandarin? Key lime? Kumquat? Let your palate be your guide. Pour olive oil into a small saucepan. Add the Murcott zest, gently rubbing it between your fingers to help extract the oils. Bring the oil and zest to a boil then turn off the heat and let stand for 1-2 hours. In the meantime, heat the sugar and milk in a medium saucepan, stirring until the sugar dissolves. In a medium-sized bowl, beat the egg yolks with a whisk. Slowly whisk the warm milk mixture into the egg yolks to temper them. Return all of the mixture to the saucepan and warm over medium-low heat until thickens slightly, stirring constantly. You’ll know the custard is ready when you can run your finger through the batter on the back of a spoon or spatula and it leaves a clean line. Pour cream into a large bowl or large measuring cup (at least 1 quart) and place a fine-meshed strainer on top. Slowly strain custard into the cream. Then slowly strain olive oil into the custard mixture. Mix and cover. Refrigerate overnight. Give a stir and then freeze according to your ice cream maker’s instructions. Serve a scoop of the ice cream with a squeeze of fresh Murcott juice or even candied Murcott zest. Orangy flavors and ice cream are my favorites. Never tried ice cream with olive oil but time to remedy that. sounds yum! thanks for the recipe. Wow! This sounds totally incredible. Thanks for sharing. 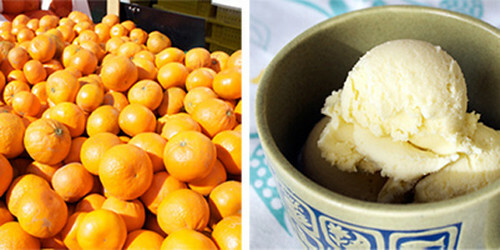 I’ve made citrus ice cream before using the zest and using fresh juice. I didn’t have any trouble with curdling. We bought a bagful of murcott’s this last weekend and they’re still on the counter, waiting for you to come over and make them into ice cream! This recipe sounds delicious. We’ve been indulging in your magnificent sorbeti over the past two days and dreading tomorrow, when it’ll all be gone. Oh, that ice cream sounds great! When can I have some?